Colleen was drawn to the practice of law while implementing microfinance and protection-based programs with women and displaced populations in Haiti. She went on to earn a Juris Doctorate degree from the University of Western New England. Prior to her work as a Trial Attorney with LDA, Colleen represented refugees in Lebanon in their appellate cases who had been denied recognition of their refugee status by the U.S. Department of Homeland Security. Colleen also holds a post-graduate certification in Post Conflict Transition from the International Peace and Security Institute in The Hague Netherlands. 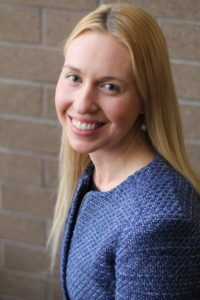 Colleen developed her expertise in criminal law while working as a Law Clerk at the Committee for Public Counsel Services in Springfield, Massachusetts and as a Law Clerk at the Federal Defender office in Salt Lake City, Utah. In 2015, Colleen spent time as a Pro Bono Attorney in a federal detention facility for women and children asylum seekers in Dilley, Texas where she provided removal defense and represented asylum seekers from Central America in their Credible Fear Review Hearings. Colleen is passionate about criminal defense work and enjoys working with her clients to uphold and enforce their rights.